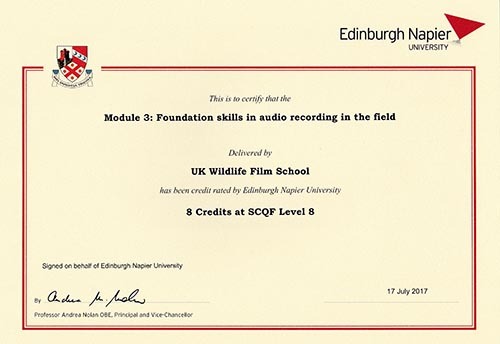 We have added these certificates to this page as a way of demonstrating to you the validity of this course. 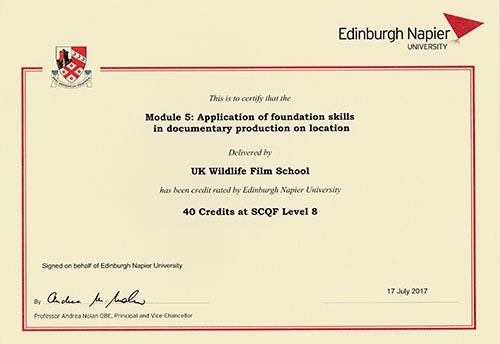 • The Diploma has been accredited by the Centre for Credit Rating at Napier University, who monitor that the Diploma falls within the correct teaching guidelines of the Scottish Credit and Qualification Framework (SCQF), offers the correct level of teaching for the points awarded for each module and runs the Diploma course to an agreed timetable / schedule / format. Should you require any further information relating to demonstrating the validity of this Diploma course, please contact either the UK Wildlife Film School, The SCQF, The SCQF website or The Centre for Credit Rating at Napier University. • To produce a ‘Broadcast Standard Wildlife Documentary’ whilst out on location, during the 8 week practical section of this 16 week film course. 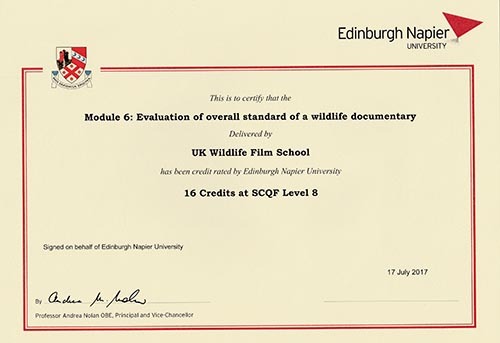 This programme is managed, delivered and awarded by The UK Wildlife Film School and leads to an award on the Scottish Credit & Qualifications Framework. It has been credit rated by Edinburgh Napier University, but is not an Edinburgh Napier University course / award..